The sum of the squares of the first ten natural numbers is, 1^2 + 2^2 + ... + 10^2 = 385. The square of the sum of the first ten natural numbers is, (1 + 2 + ... + 10)^2 = 55^2 = 3025. Hence the difference between the sum of the squares of the first ten natural numbers and the square of the sum is 3025 − 385 = 2640. Find the difference between the sum of the squares of the first one hundred natural numbers and the square of the sum? This is a very simple problem. We have to apply following two properties to solve this problem mathematically. Sum of first N natural numbers is N(N+1)/2. 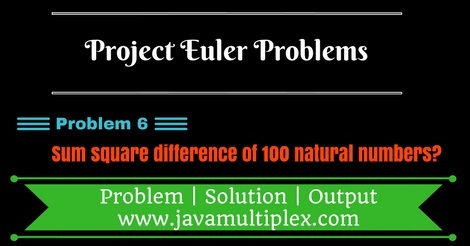 Tags : Project Euler Problem 6 solution in Java, Sum square difference, Mathematics problems, Sum of first n natural number, sum of square of first n natural numbers.